TROY, Michigan, October 8, 2018 – Last week, the Transportation Improvement Association (TIA) presented transportation safety awards during its 2018 Annual Meeting and Law Enforcement Appreciation Breakfast at the Suburban Collection Showplace in Novi, Michigan. 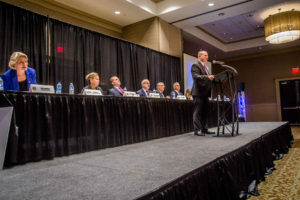 The awards honored individuals and agencies for making a tremendous impact on improving transportation safety through engineering, education, and enforcement. General Motors, Ford Motor Company, and Whelen Engineering supported the event as Diamond Sponsors. Other event sponsors included OnStar, Great Lakes Air Operations, PursuitAlert, the Suburban Collection Showplace, and WatchGuard. Elected as Michigan’s 42nd Secretary of State in November 2010, Ruth Johnson has made traffic safety a top priority for the Michigan Department of State. The agencies Traffic Safety Section was created during 2015 with two new analyst positions and a manager. Today, that section has five employees. Under Secretary Johnson’s leadership, the Michigan Department of State has made great strides by implementing Traffic Safety Motor Vehicle Network Messages in the SOS branch offices, creating the new electronic law enforcement request for driver evaluation, a teen driver website, several teen booklets, and involving teens in the traffic safety process. Furthermore, the department created the Safe Drivers Smart Options program for aging drivers, and has also focused heavily on motorcyclist safety. These are only a few of several examples of the traffic safety achievements that have been made under Secretary Johnson’s leadership. Col. Kriste Kibbey Etue was appointed to the cabinet-level position of Director of the Michigan State Police by Governor Rick Snyder effective January 9, 2011. Col. Etue is the 18th Director in the 100-year history of the department and she is the department’s first female Director. She began her career with the Department of State Police in 1987 as a member of 101st Trooper Recruit School. The Michigan State Police is a full-service law enforcement organization, with approximately 2,800 enlisted and civilian employees. As Michigan’s top law enforcement officer, Col. Etue restructured the Michigan State Police to make it more efficient. Posts were reduced and more troopers were put on our roadways to improve safety throughout the state of Michigan. Furthermore, Col. Etue has been a big supporter of all traffic safety initiatives, and has gone above and beyond to participate and provide much needed resources. Col. Etue has 32 years of service dedicated to saving lives, preventing injuries, and reducing traffic crashes. Kirk T. Steudle began his career with the Michigan Department of Transportation (MDOT) in 1987. A registered professional engineer, he rose through the ranks of the department to his current position. Gov. Rick Snyder appointed Steudle state transportation director on January 1, 2011. He also served as state transportation director from 2006 to 2010. Steudle oversees MDOT’s $4.7 billion annual budget and is responsible for the construction, maintenance and operation of nearly 10,000 miles of state highways and more than 4,000 state highway bridges. He also oversees administration of a wide range of multi-modal transportation programs statewide. MDOT currently has 2,500 employees. Steudle is a national leader in the development of connected vehicle technology, which allows vehicles to communicate with the road and other vehicles to improve safety and mobility. He continues to work with a partnership of governments and auto manufacturers to further high-tech highway operations and, at the same time, improve Michigan’s economy. Under Steudle’s leadership, Michigan became a worldwide leader in the area of Intelligent Transportation Systems. These systems will play a significant role in greatly reducing injuries and fatalities that result from motor vehicle crashes. Steudle has 32 years of service dedicated to saving lives, preventing injuries, and reducing traffic crashes. Chippewa Valley Schools, which is one of the largest school districts in the state of Michigan and is located in Macomb County, has designated traffic safety as a top priority both on their school campuses and within the surrounding areas. They have completed a comprehensive study of the Dakota High School, Seneca Middle School, and Cheyenne Elementary School Campus to include on-site circulation and off-site improvements in signal operations and street lighting. Additionally, a site circulation study was completed at nearby Ojibwa Elementary School, and a district wide evaluation was conducted of all crossing guard locations. The goal is to separate the modes of transportation on the school campuses, while improving traffic flow and safety both on and offsite. Ford continues to receive high marks and accolades for vehicle safety in a number of the industry’s key public and private crash-testing programs. They conduct engineering analyses, computer simulations, and component, sub-system and full-vehicle crash tests to evaluate the performance of their vehicles and components at a number of sites in the United States and Europe, which has resulted in many advancements in vehicle safety. Ford also researches human behavior with advanced driver assist features, human-machine interfaces, and factors such as drowsy or distracted driving, and explores and develops new and advanced technologies in the areas of passive safety, driver assistance, connectivity, mobility and autonomous vehicles. Ford is also working on vehicles that communicate with each other and with the world around them. They share findings with colleagues who are working toward their vision of an integrated transportation ecosystem. Ford Driving Skills for Life is a comprehensive award winning teen safe driving program. Ford Driving Skills for Life addresses the critical issues surrounding newly licensed drivers. Developed by the Ford Motor Company Fund in partnership with the Governors Highway Safety Association in 2003, the program continues to grow in the United States and globally. The Ford Driving Skills for Life program has covered 19 countries, 42 states, 103 cities, and 875 school districts. Vehicle safety is a top priority at General Motors. Many of GM’s vehicles now offer a comprehensive suite of available active safety technologies and adaptive crash-avoidance features that can help enhance driver awareness to potential crash threats, allowing the driver to react and make changes to avoid them. Furthermore, GM continues to be involved in the connected vehicle arena, and has many capabilities available through its unique OnStar resource. On September 19, 2016, Mitchel Kiefer was tragically killed in a car crash caused by a distracted driver on I-96. Founded to honor Mitchel’s legacy, the mission of the Kiefer Foundation is to end distracted driving and all associated traffic deaths and injuries. The Kiefer Foundation focuses on three pillars to support its mission: Awareness, Policy, and Technology. Within each of these pillars are specific goals they hope to achieve and initiatives in which they hope to get involved. Mr. Steven Kiefer, the father of Mitchel Kiefer, accepted the award. The City of Novi, including the Police Department and Engineering Division, has made traffic safety a top priority for many years. They have taken a continuous, proactive, and data-driven approach to the monitoring of intersection safety beginning with the 2012 thoroughfare planning through recent 2018 update study. The City completed a recent installation of street lighting upgrades throughout the City and a FY2019 safety project development for signal modernization, street lighting upgrades, and turn lane installations. In 1967, Oakland County has a fatality rate of 6.8 deaths per 100 million vehicle miles of travel. Their rate was higher than both the national and state rates. During that same year, more than 200 government officials and corporate executives came together to form TIA. Shortly after, the Road Commission for Oakland County and Oakland County Sheriff’s Office soon designated traffic safety as a top priority. Both agencies have been recognized as national leaders by consistently implementing new technology and practices. As a result of their leadership, Oakland County went from having a fatality rate of 6.8 deaths per 100 million vehicle miles of travel in 1967 to 0.55 deaths in 2017. The 2017 rate is less than half of the national rate, and nearly half of the state rate. Distracted driving is a dangerous behavior that can have tragic consequences. In an effort to change driver behavior and reduce distracted driving, Operation Ghost Rider was launched in Macomb County on April 25, 2017. Operation Ghost Rider uses unmarked spotter vehicles, which contain a law enforcement passenger. When the spotters observe a distracted driver, they radio a fully marked law enforcement unit to initiate a traffic stop. The program is so unique that The Wall Street Journal featured it as a national story. Participating agencies have included the Auburn Hills Police Department, Clinton Township Police Department, Macomb County Sheriff’s Office, Michigan State Police, Oakland County Sheriff’s Office, Shelby Township Police Department, Sterling Heights Police Department, and Utica Police Department. During the latest mobilization earlier this year, 49 officers (state, county, and local) stopped 530 vehicles, issued 440 citations, and made 9 arrests in 6 hours. Ford Motor Company, General Motors Company, State Farm, Joyson Safety Systems, Carrier & Gable, AECOM, the DTE Energy Foundation, HNTB, Hubbell, Roth & Clark, OHM, WadeTrim, Medstar Ambulance, and ABS Storage Products and Police Equipment all support TIA throughout the year.